Rory Kleinveldt hit a quickfire 23 and took a wicket on his Northants return, but the Steelbacks were to suffer a six-wicket defeat at Durham Jets on Friday night. Kleinveldt had not featured since June 6, when he sustained a side strain during a stunning innings against Nottinghamshire Outlaws at Trent Bridge. 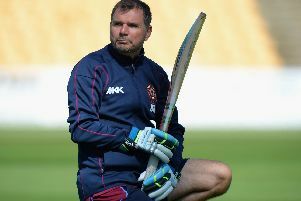 But he was back in action at the Riverside Ground, boosting a Steelbacks side who were looking to bounce back after last Friday’s defeat to the Outlaws at the County Ground. However, David Ripley’s men were to make it back-to-back NatWest T20 Blast defeats as the Jets chased down the Steelbacks’ 149 for five to win with nine balls to spare. Seekkugge Prasanna took three for 24 and Kleinveldt one for 30, but Keaton Jennings (36no) and Michael Richardson (22no) struck up a winning partnership to see their team home. The Steelbacks had earlier ended on a below-par total after they were forced to rebuild following the loss of early wickets. Richard Levi departed from the first ball of the innings as Chris Rushworth removed the South African’s off stump. Adam Rossington (5) went soon after, leaving the Steelbacks 14 for two, but Cobb and Ben Duckett came together to lay the foundations for the innings. Cobb eventually went for 68 from 51 balls as Jennings bowled him and then dismissed Steven Crook for just one. Kleinveldt then came to the crease to join Duckett, who was delivering another innings of high quality. And after Kleinveldt was caught off the final ball, bowled by Paul Coughlin, the Steelbacks had set their hosts 150 to win. The Jets had not been beaten on home turf in the competition this season, and they set about the Northants total in confident fashion. But when Phil Mustard went for 40 in the 10th over, with Prasanna having him caught by Crook, Durham started to wobble. England star Ben Stokes departed for just one as he was trapped LBW by Prasanna, and Gordon Muchall was dismissed first ball by Kleinveldt. When Prasanna got the wicket of opener Mark Stoneman for 40, the Steelbacks had real hope. But Jennings and Richardson steadied the ship, steering their side to a victory that lifts them to third in the NatWest T20 Blast North Group. The Steelbacks remain second, now two points behind Nottinghamshire, with a key game coming up against Birmingham Bears at the County Ground on Tuesday evening.